The cosmology community is abuzz with news from the BICEP2 experiment of the discovery of primordial gravitational waves, through their signature in the cosmic microwave background. If verified, this will be a clear indication that the very young universe underwent a period of acceleration, known as cosmic inflation. During this period, it is thought that the seeds were laid down for all the structures to form later in the universe, including galaxies, stars, and indeed ourselves. The cosmic microwave background (CMB) is radiation left over from the Hot Big Bang, first discovered in 1965 and corresponding to a temperature only about 2.7 degrees above absolute zero. In 1992 the COBE satellite made the first detection of temperature variations in the CMB, and successive experiments, including satellite missions WMAP and Planck, have been accurately measuring these variations which have become the key tool to understanding our universe. In addition to its brightness, radiation can have a polarisation, meaning that the electromagnetic oscillations that make up the light have a preferred orientation, e.g. horizontal or vertical. This same effect is used in 3D cinemas, where light of different polarisations reaches your left or right eye, the lenses in the glasses blocking out one or other from each eye. In the CMB the polarisation signal is very small, and moreover comes in two types, known as E-mode and B-mode polarisation. The second of these, corresponding to a twisting pattern of polarisation on the sky, is what BICEP2 has discovered for the first time. This twisting pattern is the signature of gravitational waves, created in the early universe and whose presence causes space-time itself to ‘wobble’ as the light from the CMB crosses the Universe. 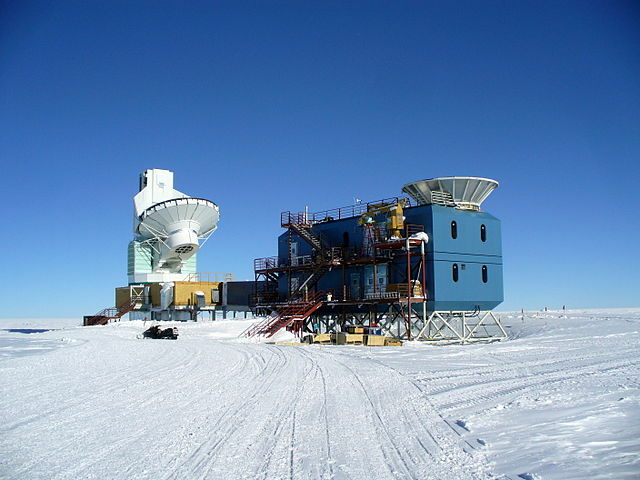 The Dark Sector Laboratory at Amundsen-Scott South Pole Station. At left is the South Pole Telescope. At right is the BICEP2 telescope. Photo by Amble, 2009. CC-BY-SA-3.0 via Wikimedia Commons. The BICEP2 team have been working for several years with the single aim of measuring this signal; inflation predicted it to be there but said nothing about its strength. Based at the South Pole, where the unusually clear and dry air creates an ideal viewpoint for accurate measurement, three years of observations were carried out from 2010 to 2012. Their experiment differs from others measuring the CMB polarisation because they focussed on covering as large an area of the sky as possible, at relatively moderate angular resolution, in order to specifically target the B-mode signal. While the discovery of gravitational waves had been widely rumoured in the days leading up to the announcement, including even the size of the measured signal, what took everyone’s breath away was the significance of the signal. At 6 to 7-sigma, it exceeds even the gold-standard 5-sigma used at CERN for the Higgs particle detection. Most would have expected something tentative, 2 or 3-sigma perhaps. We will want verification, of course, especially because the use of just a single wavelength of observation (the microwave equivalent of using just one colour of the rainbow) means the experiment is a little vulnerable to radiation from sources other than the CMB, such as intervening galaxies or emission caused by particles spiralling around our own Milky Way’s magnetic fields. The strength of the detection suggests that will not be an issue, but for sure we want to see independent confirmation by other experiments and at other wavelengths. Some may have announcements even before the end of the year, including the Planck satellite mission. The response of the cosmology community to BICEP2 has been staggeringly swift. Early communication and discussion was already underway during the web-streamed BICEP2 press conference, via a Facebook discussion group set up by Scott Dodelson at Fermilab. The first science papers using the results were already appearing on arXiv.org database within the next couple of days (including these ones by me!). By the end of March, only two weeks after the announcement, there were already almost 50 available papers with ‘BICEP’ in the title, written by researchers all around the world. Papers on BICEP2 are clearly going to be a main theme for astronomy journals, including MNRAS, for the remainder of the year as we all try to figure out what, in detail, it all means. Andrew Liddle is Professor of Theoretical Astrophysics at the Institute for Astronomy, University of Edinburgh. He is an editor of the OUP astronomy journal Monthly Notices of the Royal Astronomical Society. Monthly Notices of the Royal Astronomical Society (MNRAS) is one of the world’s leading primary research journals in astronomy and astrophysics, as well as one of the longest established. It publishes the results of original research in astronomy and astrophysics, both observational and theoretical.